Why Market Corrections Are a Good Thing | Pure Financial Advisors, Inc. 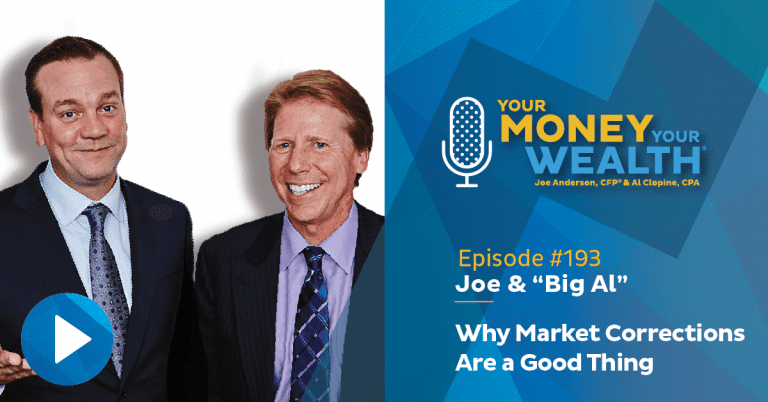 The market has been in correction territory more than once over the past week, and Joe and Big Al explain why that’s a good thing. Plus, is the three bucket investing and withdrawal strategy good for large portfolios? What’s the real value of your net worth? Ways to protect your sanity and your money as you age. And, on the heels of the Red Sox winning the World Series, Big Al’s got some baseball and money stats. (30:26) Big Al’s List (cont’d), What is the Actual Value of Your Net Worth? 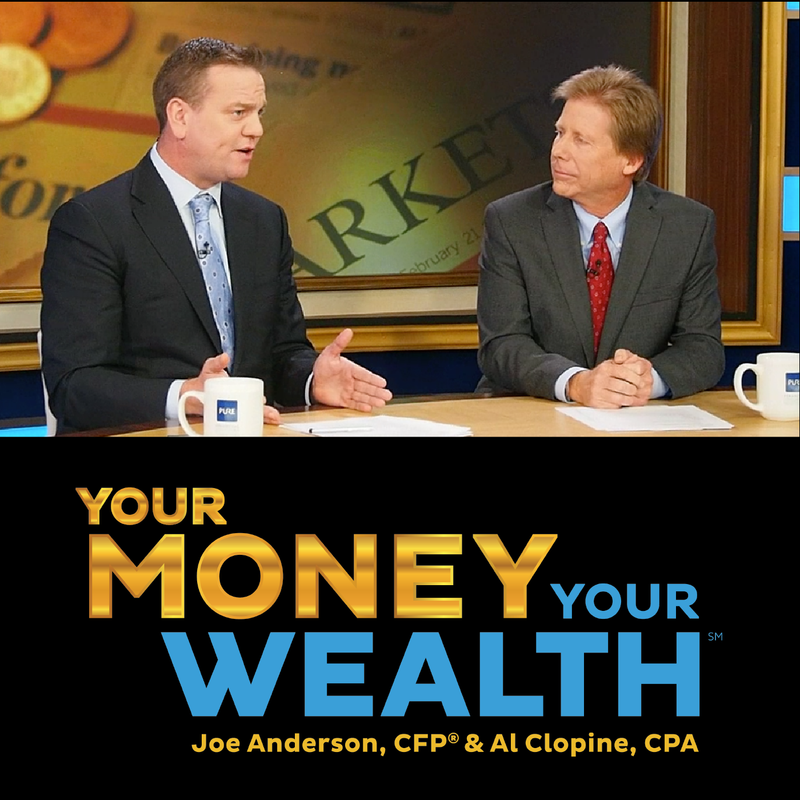 Tax reduction strategies for high-income earners is the topic on this week’s Your Money, Your Wealth TV show. Watch it and download our free 2018 Tax Planning Checklist at YourMoneyYourWealth.com – and be sure to subscribe, new TV episodes are available every Sunday. Today on the Your Money, Your Wealth podcast, is the three bucket investing strategy good for large portfolios? Plus, what is net worth and what’s the real value of your net worth? The fellas crack up telling stories while talking about ways to protect your sanity and your money as you age and you’ll think they’ve lost their sanity. And, on the heels of the Red Sox winning the World Series, Big Al’s got some baseball and money stats. But first, over the past week, the market has been in correction territory more than once. Here, to explain why that’s a good thing, are Joe Anderson, CFP® and Big Al Clopine, CPA. JA: We hit almost correction zone. AC: We did. Yeah, we’ve had kind of a rough week and a half. JA: A rough month. So what was down 10% across the board with all indices. What do you think are the reasons? There are a lot of pundits out there saying a lot of different things. AC: Yeah. Well, I’ll tell you what, my answer to that is there’s not much rhyme or reason. People try to assign reasons, but it doesn’t really work that way. There is a lot of emotion. And sometimes when stocks go down people get fearful and then it exasperates it. The same happens on the upside too, but it doesn’t seem to be quite as dramatic on the upside as it is on the downside. JA: So first let’s define what a correction is – a correction is when a stock market is down 10% of any recent high. The frequency on it, it happens a lot more often than you think. On average it’s probably one and a half times a year. Even though we don’t experience it maybe two times a year, but there’s been some years where you’re going to see a lot more volatility than others. And I think we’ve been complacent and recency bias is really in the forefront right now, because I think a lot of people are freaking out a little bit. AC: Well because the stock market historically is volatile, and just like you said, typically each year we’ll get one or more corrections. And the fact that we’ve had so few the last nine years, it’s like people have forgotten this is normal. Actually, that’s normal to have corrections. JA: Right. If you’re a saver right now, you should be extremely excited. AC: I totally agree. So explain. JA: Because when markets go down, if you’re saving money into your 401(k), IRAs, Roth IRAs, brokerage accounts, you know what? You’re buying these same really good companies, really good stocks, really good mutual funds, at now a lot lower price. AC: Right. If you’re adding new money, you’re getting cheap prices. JA: And so if you were an investor at all… I know some of you are listening and saying, “Joe, I’m 65 years old, I’m looking at retiring in the next couple of years and I need this money.” Well yeah, but you need that money to still continue to last you another 25 years, potentially. 65, 75, 85. We run all of our financial plans to age 90. JA: I’m sorry, 95. (laughs) Thank you. AC: We should probably change it to 100. JA: I saw Ric Edelman’s plan. (laughs) It’s like a big plan because it’s about 250. But if you look at it that way, you have to have some sort of equity in the overall portfolio, and when markets go down 9, 10%, what you should be doing, instead of freaking out going to cash, you should be buying more and rebalancing the overall account. That’s what buying more means. Now, if I’m saving, I’m let’s say five years from retirement, 10 years from retirement, 30 years from retirement, you want to see a correction. You want to see this thing continue to fall. Because all of this is really kind of a lot of noise, to be honest with you. What we hear – so there’s trade wars, tariffs, then you got this whole crazy thing with Saudi Arabia. I mean what the hell is going on with that whole thing? And it’s like, okay well what is that going to do to oil, and then you have, what, Italy is doing their own thing with the Eurozone. They’re like, “hey, we like to spend money, go pound sand,” and then that’s kind of causing friction. The market totally overreacts, quite a bit, and then you look, we’ve got midterm elections coming up. It’s weird how these politicians kind of pull stunts. All of a sudden it freaks people out, saying well, I want to go either right or the left because of what I’m feeling right now, and I’m probably going to get a couple of emails for that comment but that’s all right. AC: (laughs) You notice I’m being silent. You just keep on talking. JA: Yes. But here’s what, if you look at all of the different things that are going on, there are always going to be crises, there are always going to be issues, there are always going to be things that are not good, and the media likes to play on that. AC: Yeah and I think that’s what we forget. And you can go back six months, a year, five years, 10 years, 20 years, 30 years – there are always crises happening. And we forget that. It just seems like it’s never been like this. It’s always been like this, what are you talkin’ about? JA: Right. But when you hear all of this stuff, but when the market goes up, eh, it’s not really that big of a deal. But when you see market volatility, then people really start to focus in on it. The problem is that when individuals retire and if they don’t have a really good strategy for their retirement, and not necessarily the financial part of it. But you know how we like to talk about the softer side? I mean, they need hobbies! People need hobbies because when they’re retired and they’re living off their money, what do they do? They look at it more often than they probably should. And if I’m continuing to look at my assets and I’m looking at the news, and then all this crazy AI BS is unbelievable, because you look at one stupid thing on your phone on whatever feed that you’re doing, the next thing you know you’re bombarded by it. “What the hell’s an inverted yield curve? I heard that,” and then you type that stuff up on your phone and then you get 45 articles on how the world’s going to end and there’s a recession because of an inverted yield curve. AC: So the takeaway is that when markets decline, so a correction. So we’re in or near a correction right now, that’s defined as 10% from the highs, and that’s normal. This is usually, on average as you say Joe happens one to two times per year. We haven’t had too many lately. So this is kind of more of the norm. JA: Killing expectations. Like Tesla for instance. They’re like, what the hell? Elon Musk was going bananas, what, a couple of months ago. Because why? Now the reports come out, the guy killed it n the third quarter. AC: He did kill it and then we’ve got almost all-time low unemployment. So we’ve got people working. We’ve got lower corporate taxes. So there are more profits for companies, and yeah, some of that goes back to the shareholders, but some of that’s reinvested in buying new machinery, hiring more people, so more people are working. There’s actually, you’re right, there’s a ton of good news. And in fact, to me, if you wanted to just write an article about good news, you could write it and everything and be 100% true and you go, “oh my gosh, this is the best time in the history of the United States to invest.” And then you could also pluck out all the bad stuff. JA: And it’s the worst time to invest. AC: And it’s always been that way. Always, always. That’s the takeaway. JA: So I want this market to continue to kind of shake things up a little bit. It wakes people up. It gets them a little bit more in tune. I don’t want you to freak out, I don’t I want you to do something stupid. But I think a lot of individuals need to relook at their overall portfolios. They need to reassess their goals, what are they trying to accomplish, and then get tight, get fine-tuned on your strategy and making sure that you know how much risk that you’re taking on and what type of risks are out there. AC: Yeah I think it’s true because I think a lot of folks, like their 401(k) for example, maybe they got some kind of allocation from somebody 10, 15, 20 years ago and they haven’t really looked at it since and they don’t even know if this is the right thing for them. And this is sort of a wakeup call. You’ve got to figure this stuff out. You got to figure out what portfolio is going to make sense for you and your goals and make some adjustments now. AC: Lose the other half. JA: So there was so much negativity within the overall stock market. And it took people forever to actually trust the system. So they missed out on a huge gain. So this whole bull market that we’ve experienced over the past 10 years, what, up 300 some odd percent? It’s been kind of like, “is it really going to? Is it good? Is it bad?” And then now it’s too fraught. “Should we get out?” It’s never been like, “let’s grab the bull by the horns.” No pun intended, and “let’s ride this thing.” So I think a correction is healthy. I think a little bit of a bear market every now and again is healthy because then, guess what? Your expected rate of return is going to be a lot higher. JA: Sure. But some people got to be prepared. If you lose 20% of your money, what is that going to do to your retirement? Do you have a plan to take dollars out of your overall portfolio that’s not going to affect your stock portfolio? Do you have enough fixed income in place? Do you have a bailout plan? Do you have a plan B? AC: Do you have enough safe assets that you can pull from while you wait for the stock market to recover? AC: Oh, well thanks Chuck. Great comment. JA: That was very nice, thanks Chuck. AC: Actually, I guess, in full transparency, we do have clients, we’re looking for clients. But the truth is, we do this for you guys. And it’s like, we always say that everyone needs a financial plan. Not everyone needs a financial advisor. And if you need a financial advisor, not everybody needs to use us. But if you’re getting good information from our content, we’re happy. 12: 30 Is the Bucket Investing Strategy Good for Large Portfolios? JA: Buckets. What say you there, Big Al? What’s your answer of this question for Rich? AC: Well let me see if I can sort of paraphrase the buckets of money strategy. So I guess the idea is you have really safe assets in the short term bucket, because that’s what you’re going to draw upon for the next year or two, maybe three, whatever. AC: (laughs) A few stocks in there I think. Anyway, the concept is fine. I guess we would say it differently though. So although I like the concept, I’m going to tell you how we would think about this, which is, kind of get rid of the buckets of money idea, although it’s not necessarily bad, per se, but I would say this: first, there are a couple ways you can go about this. One is, Rich, to figure out what you’re spending needs are, and it sounds like you have- that’s $50,000 a year. So let’s make sure you’ve got at least 10 years of safety. So that’s 50 times 10. That’s $600,000 – that’s probably where you came up with the 15%, I’m guessing, of the $3 million. That is a way. But that’s only one way to figure out exactly what you want. That’s one approach. Another approach, go it at a different direction, which is the $50,000 out of your portfolio of $3 million, what rate of return you need? And the rate of return is probably relatively low at $50,000 on $3 million. That’s what, a percent and a half, maybe? Something like that – lower than 2%. So in other words, you don’t have to take much risk. You could have a much higher bond portfolio if you want to. On the other hand, because you have not that huge of a need, you could take bigger risks. So now I’m going to go back to, like, what’s your long-term goal? Do you want to grow this thing for your kids, for charity, or are you good with where you’re at, you just want to be safe, you don’t really want to be bothered with the ups and downs of the market? You’ve got a little bit of latitude there. JA: Right. I’ve got a few comments. You know given the bucket strategy – there are multiple bucket strategies. There’s just an individual here, used to practice and in San Diego, that had a book that was called that. But no, I like the strategy a lot, actually. In regards to looking at having different components, if you will, to say hey, over the next 10 years, just be very safe, because very rarely have you seen a 10 year period where a globally diversified portfolio has lost money. AC: Yeah. So make sure you’ve got 10 years of income needs in really safe money that you can withdraw. Regardless of what the market does. JA: But then I’m looking at Rich’s point, he’s like, well wait a minute, I don’t need a ton of money and if I’ve got several million dollars, does this even make sense? So how you have to look at it is a few different things. That’s kind of the first step. It’s like, you need $600,000. AC: That’s where you start, that’s not where you stop. AC: Yeah. Because you’re telling me the rest in stocks? That seems like a lot. JA: Right. So there’s something that’s called risk tolerance and risk capacity. We’ve talked about this a little bit in the past. A lot of times it’s the opposite, where people have to take on maybe a little bit more risk than what they’re comfortable with. AC: Because they need too high of a rate of return. JA: Yes, they need to generate a 4, 5, 6% rate of return, versus maybe just sitting in cash or T-bills. So there you have to push that individual to say, “hey, you might need to take on a little bit more risk to outpace taxes and inflation and accomplish your goals.” On the flipside, Rich here, he could sit in cash and accomplish his goals. But is that the prudent thing to do? So I agree with you 1,000% Al. I think you’re fine. What you could do, Rich, is say, ” let’s carve this stuff out so I know that I’m going to be safe for the next 40 years.” He’s only 56. So then you know no matter what happens within the markets, within the bond market, the stock market, you know you and your family are going to be fine. You throw a different “what if?” in there. A long-term care stay. All sorts of crazy expenses. And then after that, he could say, “well, I still have these dollars here.” Maybe you want to take on risk for that for your kids, your grandkids, for charities, or things of that nature. So it really depends on his goals and what he’s trying to do. But here’s what I would say. I would take the least amount of risk possible to accomplish your goals. AC: Yeah I think that’s the key. So make sure you’ve got 10 years of safety, and then take the least amount of risk to accomplish your goals on the rest of it. JA: Right. And those goals could be several goals, it could be I want to make sure that I have a little bit for my kids. I want to make sure I have a little bit for some charities, for my church, and blah blah blah. AC: Yeah. Long-term care, and a lot of folks, when they actually do retire, they end up spending more – they travel more, they spend more on hobbies, and maybe you’re around the house more, and it’s like, “oh gosh, wouldn’t it be nice if I had a patio?” So then you go out and buy the lumber, you hire someone to do it, and all the sudden you’re spending more money. JA: So I would encourage Rich to spend more money. But if you’re 56 and you’ve got three million bucks – he’s a pretty good saver. Unless he inherited it all, which could be a possibility. JA: So that’s our two cents Rich, I appreciate you tuning in to us and writing in. If you’re the visual type, video of Joe and Big Al answering some of your emails – like that one about the bucket investing and withdrawal strategy – are now available on our YouTube channel. You can also watch the Your Money, Your Wealth TV show, see hundreds of videos on just about every personal finance topic that affects you, and listen to the entire podcast on YouTube if you so desire. Find links in the show notes at YourMoneyYourWealth.com or check us out and subscribe at YouTube.com/PureFinancialCFP. Time now for Big Al’s List: Every week, Big Al Clopine scours the media to find the best tips, do’s and don’ts, mistakes, myths and advice to improve your overall financial picture – in handy bullet-point format. This week, 11 Ways to Protect Your Money and Sanity as You Age. AC: This is written by Ken Fisher. JA: All right. So this is timely because the markets are volatile, so you gotta keep your emotions in check. And you got to be smart with your money. That’s not saying don’t do anything. That’s being strategic on what you should be doing right now in volatile times. AC: Yeah. So I’m going to go through these and let’s see if we agree or disagree. Here’s the first one: “take seriously the need to finance a long life. You’ll likely live lots longer than you expect, lifespans keep increasing and will continue to increase. In 1952, the average expectancy was 68.6 years. By 2006 it was 77.8.” But here’s the more important stat, although it’s not in here, is if you made it to retirement age – and let’s just call that 65. If you’ve made it to 65, in all likelihood as a male, you’re going to live 20 years. As a female, 24 years. That’s really what you have to fund in retirement. That’s the median. That means half of you are going to live longer than that. So you probably ought to be set or planned at least to age 90, maybe even 95. JA: Sure. Yeah, I agree with that wholeheartedly. There’s so much advance in technology it’s crazy. Just think in the next 5, 10 years what’s going to happen. AC: Right. What’s already happened and what’s probably going to happen. JA: Right. So yeah, longevity is here. I think people are a little bit naive with it. Because they might not have saved enough and they’ll be like, “Oh no, I’m not going to make it that long. I don’t want to plan…” Well sure, we never know when we’re going to die. And I don’t think we want to know. (laughs) I surely don’t. But you absolutely have to plan. Because if you think about it, just picture yourself 15 years from now flat broke. AC: Yeah. So you made it to 80 but you got no money. JA: Then you’re done! It’s like, well no. AC: Not a good way to go out. JA: I mean, Al, you’re 60. It doesn’t probably feel like you’re 60, does it? JA: You probably feel like you’re 40. JA: Yeah, you look it too. JA: Put that in real terms, Junior needs a little bit of cash. And so we’re going to put a limit on what we give? AC: Yeah, so Junior lost his job for example, and it’s like, “All right, well we have to pay his mortgage for the next month or two” which becomes a year or two years. JA: So then you say OK we cut this thing off before Junior even loses his job? And say if this ever happens are we are only going to give a certain amount of money? AC: Or I think another way to look at this is, if your kids think of you as a piggy bank, it could stifle their motivation to be successful. And then they could come back to you. JA: (laughs) Oh, OK. Are you speaking from experience? AC: Slightly. (laughs) I know you don’t have kids so you don’t really get it. AL: But does that go the other way as well? If you’re part of the sandwich generation, what about taking care of your parents? AC: I think so. And then certainly if you run out of money at age 80, you’re going to be asking your kids for support. Maybe they need to have the discussion earlier. (laughs) OK, not much more to say about that one. Number three is “consider downsizing: saves money, makes life more manageable, eases future burdens on offspring, but it causes more upfront hassle and reduces the guest potential.” In other words, if you have less bedrooms, less guests – maybe that’s a good thing. JA: That’s probably a really good thing. AC: You’ve got to big of a home, have you ever had a night in the last two years where you didn’t have a houseguest? AC: It seems like you always have at least one or two. JA: (laughs) Someone always kinda crashes over. Yeah, the past probably two weeks have been very nice. AC: Just you? I know we had a little gathering at your place last Friday. Very fun, by the way. JA: Yeah, it was a really good time. So yeah, I had a couple people crash Friday. Oh, then my sister was in town Saturday. She stayed Sunday, Monday, Tuesday. So yeah. Wednesday, Thursday, tonight’s free! AC: What about this weekend? AC: Anyway, so downsizing – and what’s interesting is a lot of people don’t want to downsize. We’ve looked at all kinds of stats, and very few people actually want to. JA: Right, they want to live in their home. AC: Because they’re used to it, they’re used to the neighborhood, they’ve got their friends there, they’ve got their life there, maybe, whatever – their stores are there, their churches are there, whatever – their social functions. All of the above. JA: You get a sense of comfortability too. You’re familiar. You might be friends with your neighbors and things like that right. The general store is just right down the street. I could see that. JA: Yeah. When you’re worth billions, you can buy them, I guess. AC: (laughs) He’s doing pretty well, right? He probably upsized. JA: He probably did. He’s got the cash. AC: So that’s the problem with downsizing. So you go from a four bedroom home to a two bedroom condo, and then all of a sudden the whole family wants to come over for Christmas. JA: Yeah I could see that. Especially if they had that big tradition to do that and cater to the family and that’s something really special. People will go deep in debt flat broke for that type of stuff. JA: Apparently he’s got a couple of grandkids now. (laughs) He just got all emotional and started writing a blog. AC: And then he writes, “and maybe you can coerce you’re no good kids to do more for you.” Whatever that means, is that from experience? “And if your kids are good – (stumbles) you will want them helping you as you age.” If I could read this I’d be really good. AC: (laughs) Feels like it. Next one is, “if you can, involve offspring in your financial decisions, have your kids involved. That’s a mixed bag there. Some parents are OK sharing that, many, I would say, are not – especially if they have a lot of money and they don’t necessarily want their kids to know it. AC: Especially with a financial planner son. AC: Wasn’t he your first client? JA: Yeah, he gave me like 20 grand. Just blew it. Bought Platinum New Opportunities, high tech. AC: That would have been his future. JA: Yeah. Exactly. It was like a high tech fund. I bought it right in 1999 and then yeah, it imploded. But they did everything they could. I didn’t know my parents were struggling. AC: And you wouldn’t, as a kid. AC: Except you probably knew you didn’t go out. You didn’t have lavish trips, or you probably didn’t go out to dinner much, or maybe you did, I don’t know. JA: No not really. But I mean I guess I wasn’t hurtin’ for it. I didn’t really know any better. AC: Yeah same with me. AC: Your mom didn’t make them? AC: My Mom made some of mine. The brand of choice at the time was OP, Ocean Pacific with the two little bare feet on it? JA: (laughs) I would say I was the opposite of that. AC: (laughs) Yeah I could see that. 30:26 – Big Al’s List (cont’d), What is the Actual Value of Your Net Worth? AC: This is 11 Ways to Protect Your Money and Sanity as You Age, written by Ken Fisher. JA: So he’s probably feeling, what, he’s aging? AC: Well yeah, I’m sure you’ve heard him speak. He talks in short sentences and he writes in short sentences because the seventh one is “drive the safest car you can. When I was young a hot rodded. Is that a word, hot rodded? Is that how you say it? I would say I drove a hot rod, not that I hot rodded. (laughs) I don’t even know what that means. JA: (laughs) You weren’t hot-roddin’, I’ll tell you that – you’re not on the strip with the ladies. JA: (cracking up) Oh my goodness gracious. AC: (still dying) So getting back to the point – drive a safe car. What would you drive if you wanted a safe car, Joe? JA: (laughing) I don’t know, a Volvo? Like a Mercedes? AC: No you were right, it’s a Volvo. He said he’s come to appreciate and love Volvos because they’re safe. AC: Yeah, everyone else is above average except for her. She knows it. I’ve heard about it, I’ve never actually ridden with her. You have, right? AC: So what’s the experience? AC: Well that’s good that she has a Volvo. She’s got a big one too. She’s probably pretty safe. JA: Yes, it’s got little dings everywhere. I park next to her. AC: So number eight is, “build a cushion into your financial plan. Not everyone is highly disciplined about spending and planning. If you suffer a big gap between plans and realities, it causes anxiety. So how do you create a cushion? JA: What is that, a cash reserve? That’s tough to do I guess. AC: Yeah means you have to save. I mean we all want a cushion, it doesn’t say how to do it. Ken, come on – tell us what to do. JA: (laughs) Gimme a little meat here. AC: I guess what he’s getting at is probably for those of you that are not yet retired but thinking about it, try to save more, save more, save more to create a little bit extra. If you think you need a couple hundred thousand maybe shoot for $300,000 or whatever the number is you’ve got a little extra. I’ll go with that. Number nine. Know your net worth but don’t obsess over it. What is net worth? (laughs) Trying to weave you into the conversation. JA: (laughs) Thank you, thank you. Your net worth is all of your assets minus your liabilities, Alan. AC: That’s like, almost an accounting term. JA: Yes, but the problem is, how much income you can derive from your net worth I think is more important than what the number is on your net worth. I give this example often. Let’s say I had a farm back in Minnesota and it’s worth $50 million. I can never sell it, and it doesn’t produce any income. AC: Yeah. So what does that get you? JA: Right. (laughs) It means nothing. So yeah, the net worth is a good starting point just to organize your overall financial life. What do you have in assets, where your liabilities, what are your interest payments? How much money are you saving, where your assets located and so on and so forth? I think it’s really good to have a net worth statement. But I agree with Ken here. Don’t obsess over it, because it really doesn’t do any good. It’s how are you going to create that net worth to do the things that you want it to do? AC: Right. I agree with that. Number 10, have a financial backup person. Or two. JA: Why would you need a backup person? Like when I’m too old, miss an RMD? AC: You might forget to pay your bills. JA: Okay so is that what a backup person is? AC: You might forget to eat your applesauce at lunchtime. JA: Okay. Backup person. I haven’t really heard of that term before. AL: They’re not talking about a second opinion? JA: Number one. That’s if your number one choice can’t. (laughs) It’s Spanish. JA: So like a power of attorney is he talking about? AC: Yeah. So you’re married, so your backup person is your spouse. But maybe you want another backup person after that. Or two. JA: Is that like a health care directive, power of attorney for financial probably is what I’m guessing? AC: Yes. I would think so. So like I have my parents power attorney. Financial. They didn’t trust me on health. JA: Oh god. I’m getting angry just listening to this. AC: “I got huge peace of mind when a psychologist” – so apparently goes sees a psychologist, “psychologist buddy…” oh, he’s trying to say it’s just a friend, he’s not really going for himself, “…taught me to live my actions as if I’d live forever and my emotions as if I knew I’d be dead in 30 days.” So let me explain because I had to read through it. “Every time I anger, I asked myself if I’d waste time over this if I knew I only had 30 days to live. I never do. It’s calming. Anger slays investors and you.” So if you’re gonna only live 30 days, what’s the point of being angry? News to live by. JA: I’d be angry that I only have 30 days to live. AC: Yeah you’d probably be angrier. (laughs) That’s our 11 Ways to Protect Your Money and Sanity as You Age. JA: All right, well thank you, Ken Fisher, for that enlightening piece he wrote in – do we have the source? AC: Yeah. USA Today. You’re looking over my shoulder, Andi, thank you. JA: We’ll put a copy of that somewhere in our show notes. It is indeed in the show notes for today’s episode at YourMoneyYourWealth.com along with a full transcript of the entire podcast. As a matter of fact, there is a goldmine of stuff in the show notes for these podcasts – transcripts of our interviews with recent guests like Jean Chatzky, Larry Swedroe and Jonathan Clements, relevant links to articles, free downloads, videos of Joe and Big Al’s email responses – and you can subscribe and listen to the podcast free, on demand there as well. It’s all at YourMoneyYourWealth.com. Coming soon on the podcast, Dr. Stephen Wendel, the Head of Behavioral Science for Morningstar is going to tell us ways to ease the retirement crisis. Make sure you don’t miss it – subscribe to the podcast at YourMoneyYourWealth.com and if you like the show, why not do us a huge favor and share it your friends? AC: I wanted to talk baseball and finance, this is a financial show. But I like baseball too. So a few stats. This is from Nerd Wallet, so obviously it’s correct. JA: Kitces. Well no, that’s Nerd’s Eye View. NerdsWallet, I don’t know what the hell NerdsWallet is. AC: Yeah you’re right. They’re similar name but different. JA: A bunch of nerds. AC: Yeah, anyway. Have you ever thought “I’d like to go buy the Dodgers or the Red Sox”? JA: No, that would be pretty expensive. (laughs) A couple billion dollars I would imagine. AC: Dodgers, the estimate is they’re worth $3 billion. JA: $3 billion for the Dodgers? AC: $2.8 billion for Red Sox. You get a little discount there. JA: Huh. I would imagine that the Red Sox would be – well, they’re now… well they’ve always been a storied franchise. But until just recently hasn’t been successful. AC: Yeah. Until recently. The curse of the Bambino. I think was it 2004? Was that the year, maybe, they won the World Series? First time in like 70 years whatever. OK, so salaries, team salaries – the Dodgers are paying $196 million. The Red Sox $228 million. But the Red Sox got a better bargain for that. They they paid $2.1 million per win. And the Dodgers paid $2.14 million per win. JA: Wow. They’re breaking it down like that, hug? Billy Beane. AC: (laughs) Billy Beane, Red Sox won 108 games. Dodgers, 92. Then you look at the highest paid players. Any guess on the Dodgers highest paid player? AC: That’s correct. $35.5 million. And David Price on the Red Sox, $30 million. JA: Price is kind of a freak. He is. AC: A freak? In what way? JA: He gets, like, nervous. He’s awesome. I’m not saying anything bad about him. But you can see his adrenaline goes up just a smidge with he’s got people on base. AC: Yeah I’ve noticed that, but he’s a real person. JA: Well, I didn’t think he was a robot. (laughs) He plays like one. AC: So the cost, like let’s say, what if we wanted to advertise Your Money, Your Wealth® nationally – what would be the cost of a 30 second commercial? AC: Anyway it’s $635,000 per 30 seconds. JA: $635,000 if we wanted to do a 30 second commercial of Your Money Your Wealth on the World Series? JA: That’s cheaper than the Super Bowl. AC: You’re absolutely right. Super Bowl is $5 million plus for a 30 second. JA: I suppose it could be seven games in the World Series versus one game in the Super Bowl. JA: When is game 3, Friday? JA: We’re taping this Thursday. AC: Yes. And people are hearing it Saturday, so it already happened. JA: We got it covered. Tuesday this thing’s over. AC: It could be, we’ll see. So you want to go to a World Series game? One of your thoughts? AC: You know what it costs? JA: I would much rather watch it like, in my home. AC: Yeah I sort of agree with you unless it’s like you’re just a diehard fan for that team. I have been to a World Series game, and actually was awful because it was the Yankees versus the Padres in 1998, and it was game four where they swept the Padres in four games and I got to watch the Yankees celebrate. (laughs) I think the Padres got like two hits all game, something like that. JA: I don’t know. This sounds really bad and snobby but I maybe had a luxury suite or something? Then I would go? JA: I don’t like crowds! I don’t like big crowds. AC: I don’t want popcorn and hot dogs. I want filet, chicken, Caesar salad. (laughs) So anyway, the average price of a ticket in 2017 World Series was $1,000 plus. Cheapest ticket was for game five, which was $828. JA: It’s still not outrageous. AC: Well no, compared to the Super Bowl. Super Bowl is $3,100. JA: Yeah. I’ve heard people like spending like five grand on Super Bowl tickets. There’s no way. AC: Yeah. Right. So then the winning team, the players get bonuses for winning. Astros last year, they won. They got about $440,000 per player. Dodgers lost, they got about $260,000. JA: Is that average or did some players get more or did each player get the equal amount? AC: It doesn’t say, but I’m guessing it’s equal. I think that’s how they do it. AL: And did you say they get bonuses for losing as well? AC: They do. Yeah just for making it. American League, National League, which the league has won more World Series? AC: That’s correct. 65 World Series compared to 48. And the winning-est team, you probably know it, in baseball, World Series. JA: Well if it’s the American League, New York Yankees. AC: Well, either league. But you’re right. New York Yankees have won 27 times. The next closest is St. Louis, has won 11 times. That’s all I got. (laughs) Pretty interesting stuff though, right? Now you can watch the rest of the World Series armed with facts and stats. JA: Yeah. You know, when you’re having a little cocktail party. JA: Yeah. About $2.2 billion. AC: Yeah, you weren’t listening. (laughs) The Red Sox are worth $2.8 billion. JA: Alright, 2.8. All right, that’s it for us, hopefully, you enjoyed the show, we’ll see you next time. For Big Al Clopine I’m Joe Anderson, the show is called Your Money, Your Wealth. Subscribe to the podcast at YourMoneyYourWealth.com – find links in the show notes to subscribe on Google Podcasts, Apple Podcasts, Spotify, Stitcher, Overcast, Player.FM, iHeartRadio, TuneIn, and now you can listen to the Your Money, Your Wealth® podcast on YouTube as well! Email your money questions to info@purefinancial.com, or call (888) 994-6257! Listen next time for more Your Money, Your Wealth, presented by Pure Financial Advisors. For your free financial assessment, visit PureFinancial.com.